Loot Crate is a monthly box full of geeky awesomeness. 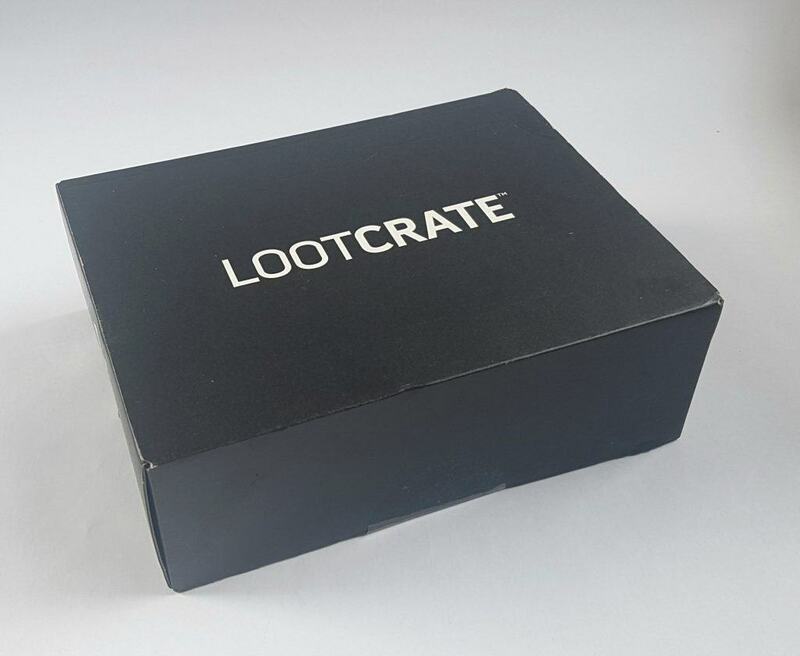 As well as their classic original Loot Crate they have several other box types, including a box for your pets, gaming, and wearables! 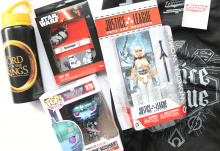 I’m reviewing their original box, the LootCrate, which contains 4 – 5 items each month, including exclusive and licensed items, with a value of at least $45. 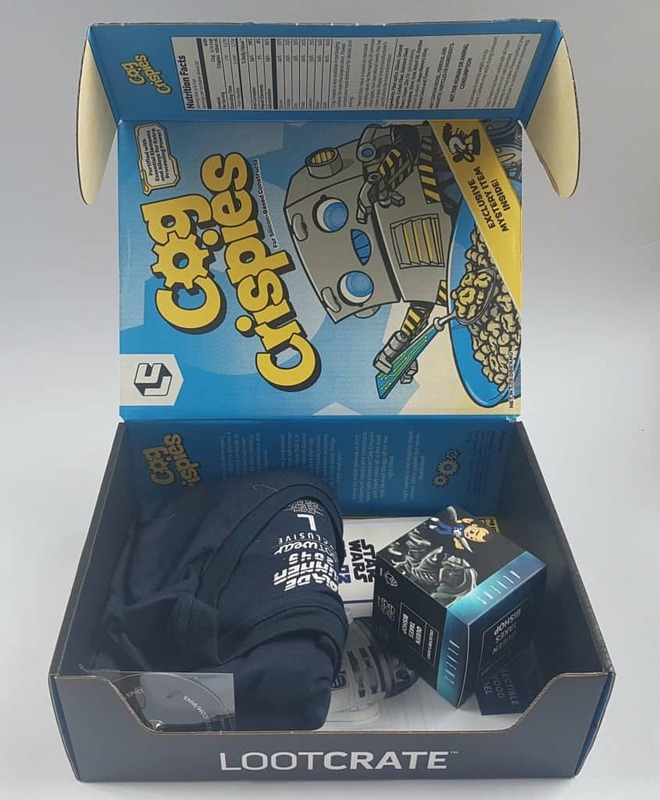 All crates include a t-shirt; you select your size when you order your subscription. This month’s theme is ROBOTIC. Opening up the box, I see a t-shirt (yay!) and a little box, but what else?? But let’s look at the t-shirt first. 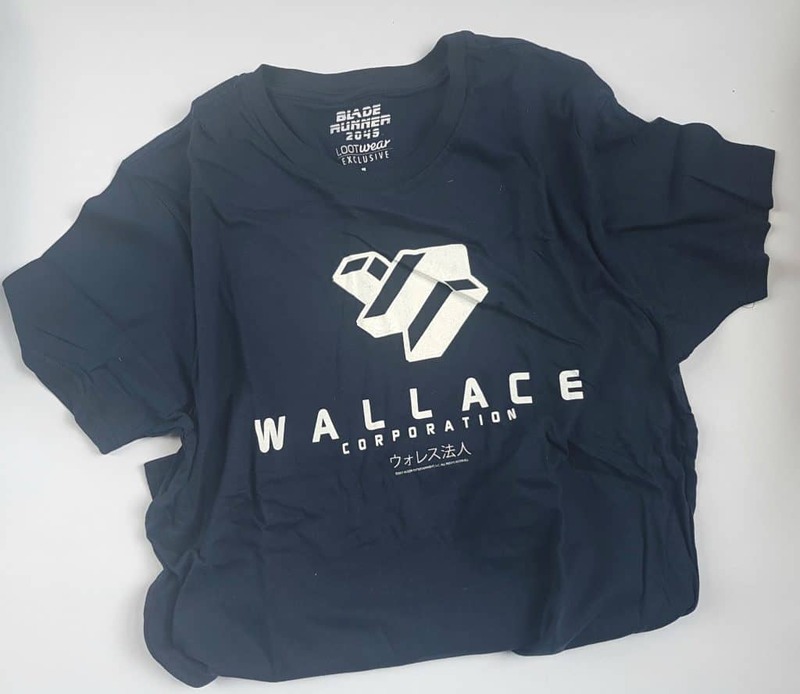 I’m very excited about the new Blade Runner movie, so this Wallace Corporation t-shirt is fantastic! It’s 100% cotton *(thank you LootCrate). Apparently it also glows in the dark. I get sent a size L shirt, so all my Loot shirts are worn as nightwear. Hopefully the glow won’t keep me awake! This was the little box on top. 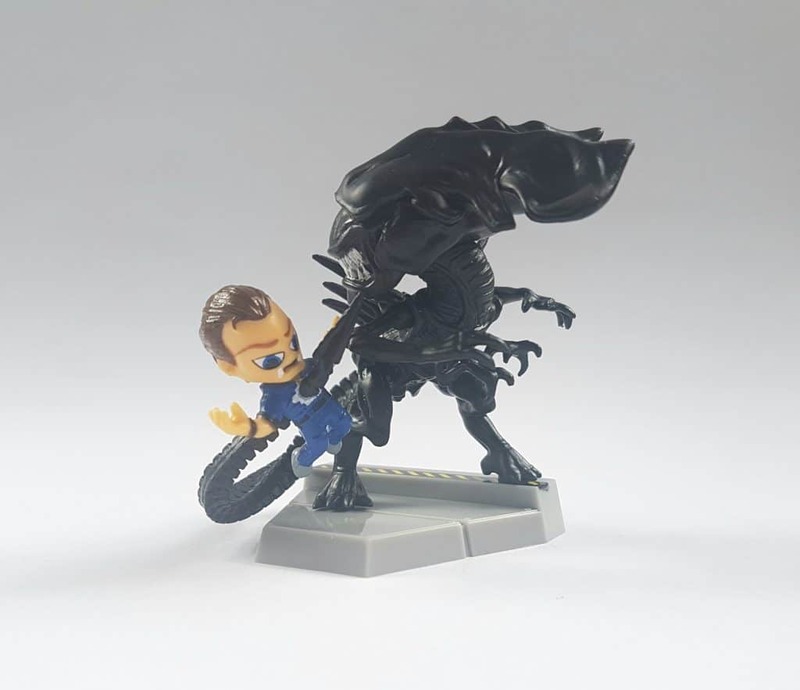 Anything to do with the Alien franchise is a huge hit in our house, so I was really looking forward to seeing this item. This awesome ‘Queen Takes Bishop’ Mini Figure comes in separate pieces, but looks like this when you put it together. I like the white ‘blood’, a great detail. 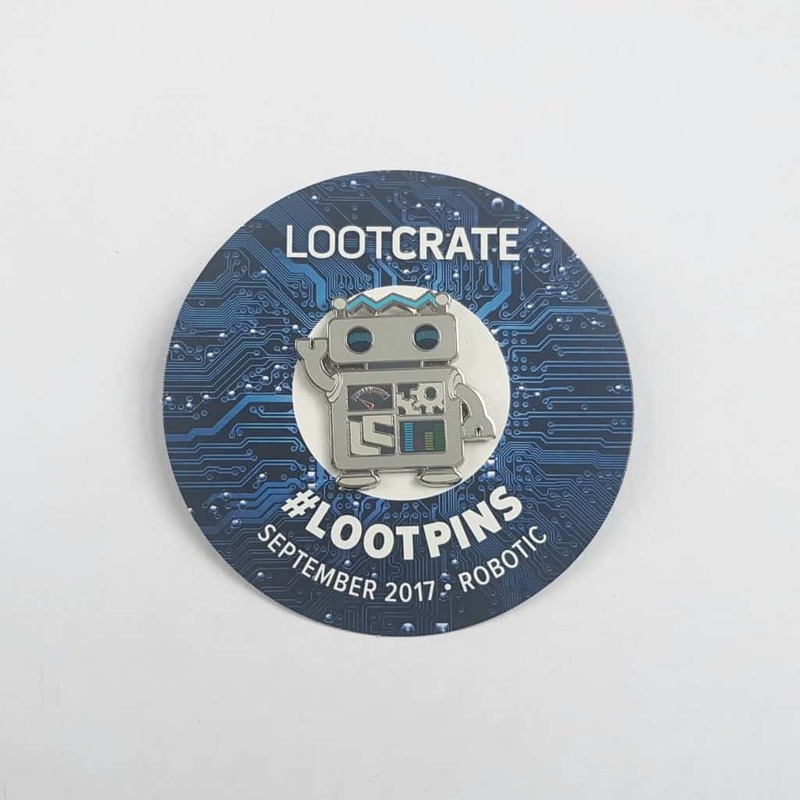 This is a LootCrate exclusive item, and in the first item in a new collaboration between LootCrate and Phat Mojo! 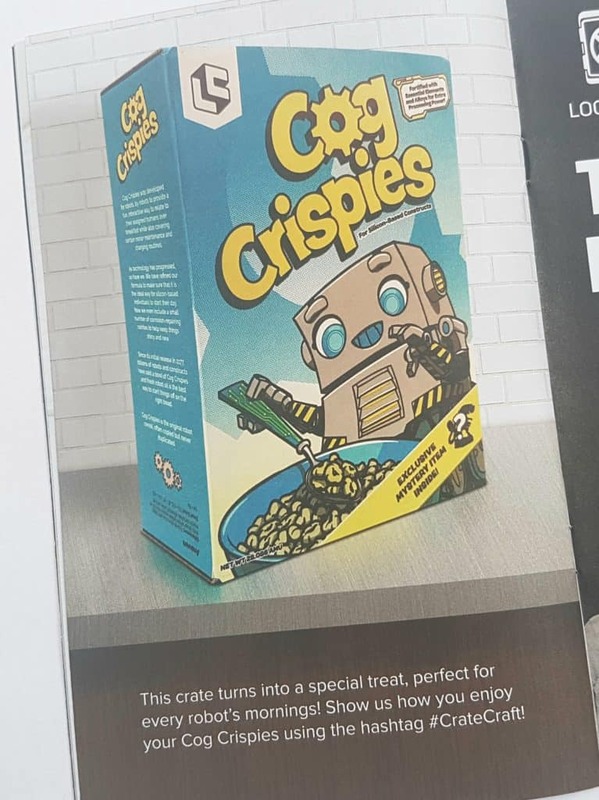 I’m looking forward to seeing what other items they come up with in the future. The next two items are the reason the box looked so empty. 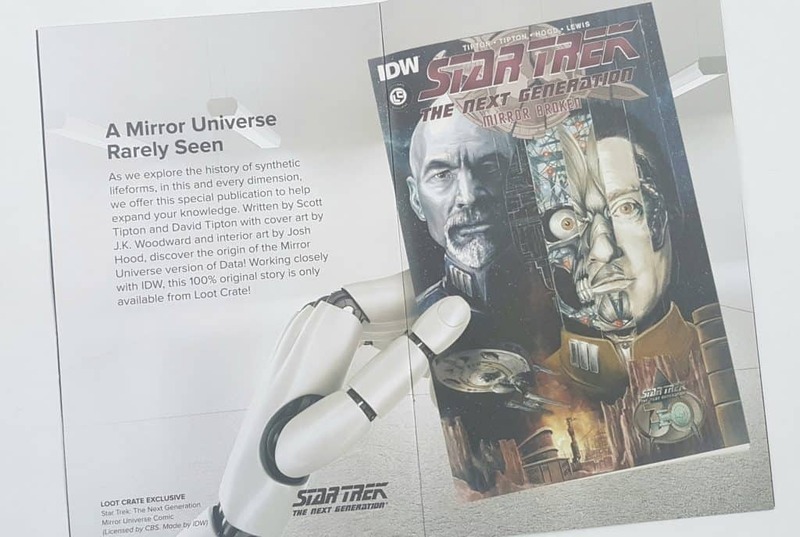 This is an exclusive LootCrate Comic – Star Trek: The Next Generation Mirror Universe. 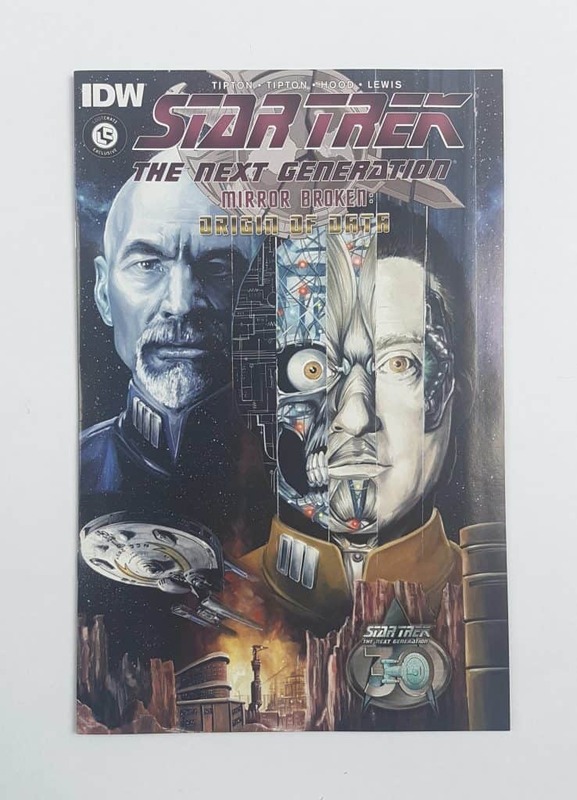 This comic tells the story of the Mirror Universe version of Data. 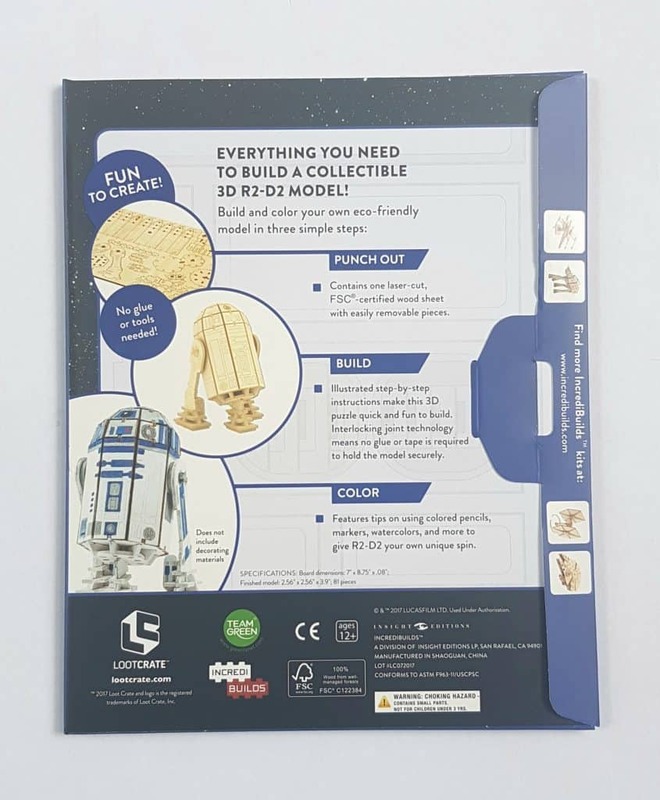 Another flat item, this time a Star Wars R2-D2 Incredibuild. 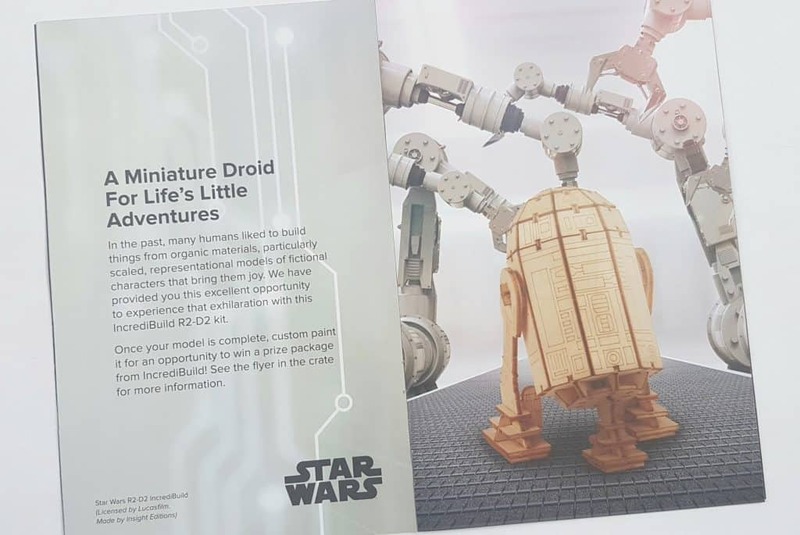 Basically, it’s a set of wooden cutouts you slot together like a puzzle to make a little replica R2-D2, and then decorate it as you wish. 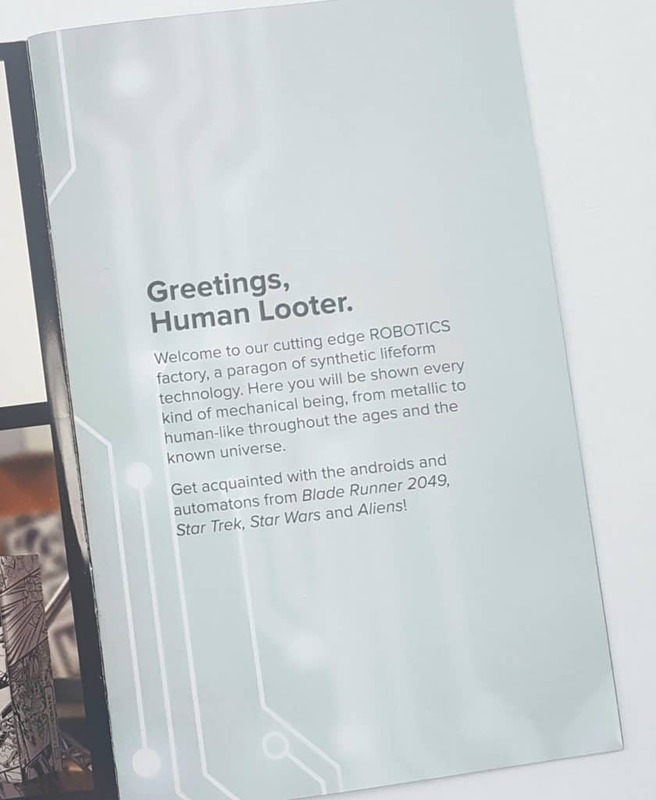 This is LootBot! Isn’t he adorable? Also included is the usual menu booklet, with a bit of info about the contents. There are also instructions to transform your crate. This one is super-easy. Basically you turn the box inside out! 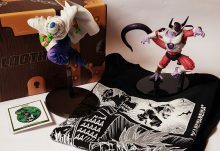 LootCrate claims that each box contains at least $45 (about £35) worth of goodies. 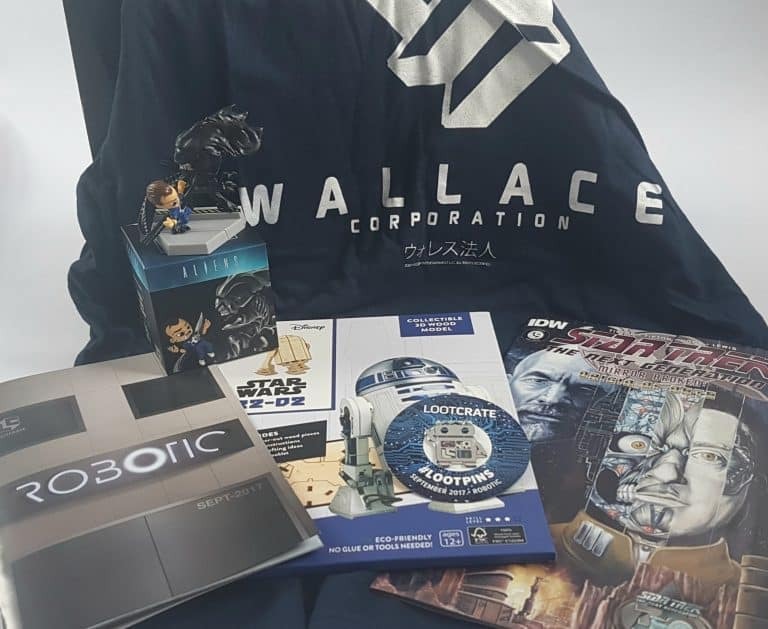 Every item is a LootCrate exclusive, so it’s difficult to assign a commercial value. However I can sort of find equivalents and guesstimate, though I don’t use eBay as I find their prices are not a useful guide to value. I’ll also add my thoughts as I go along. T-shirt – geeky t-shirts usually retail around £10. 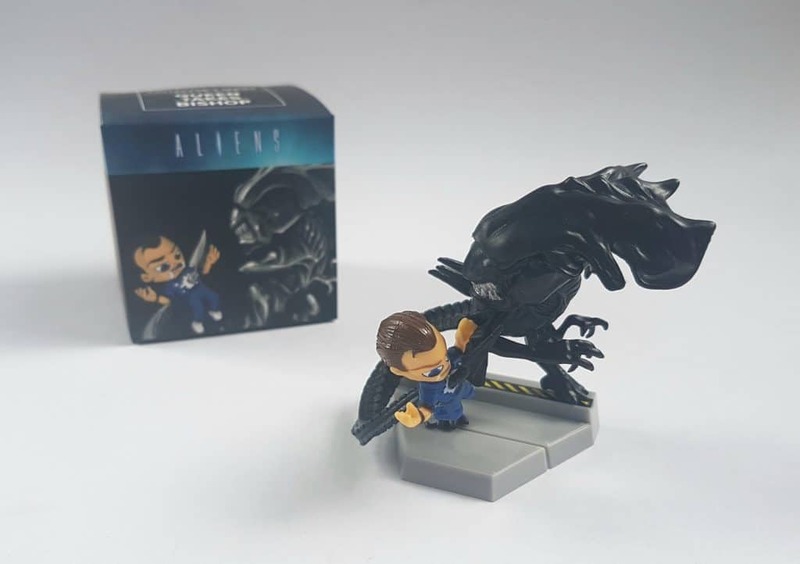 Aliens Mini Figure: this is a Loot Crate exclusive, and I can’t find an equivalent. Phat Mojo are kind of hard to price, so I’ll be generous and put it at £10. It’s a pretty small figure (though it’s very cool) so I think that’s a fair value. 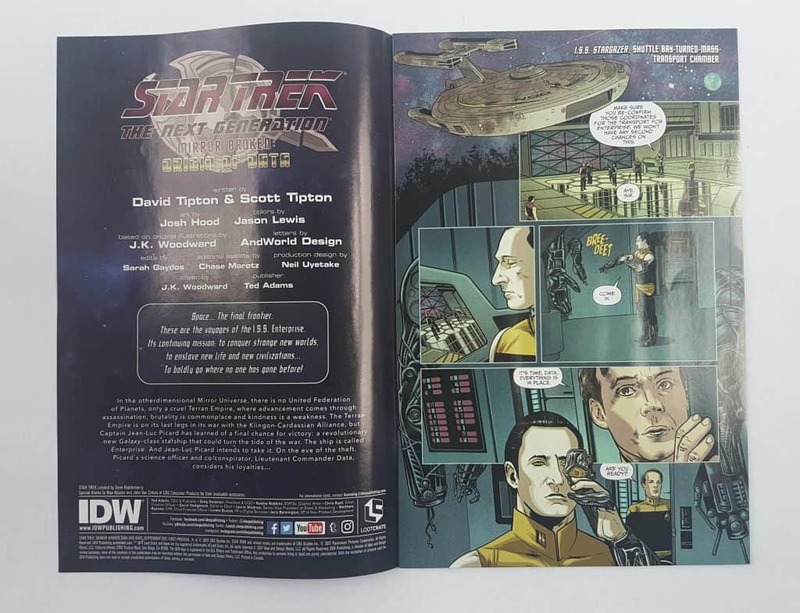 Star Trek Comic: Again, an exclusive. 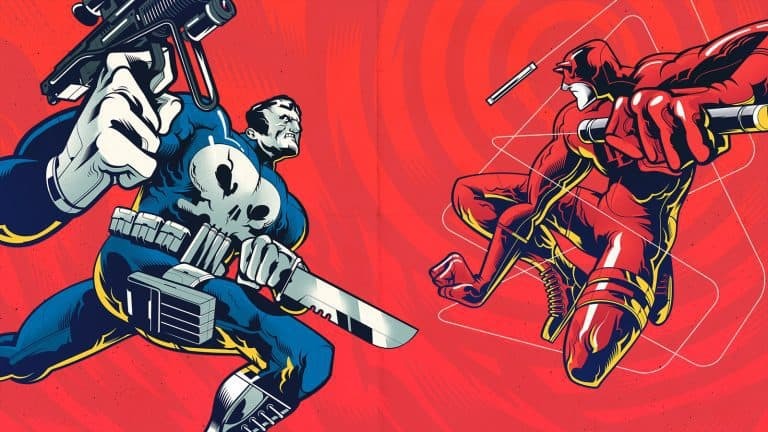 Comics are difficult to value because so much depends on their rarity. I guess as this is an exclusive I’ll call it £10. 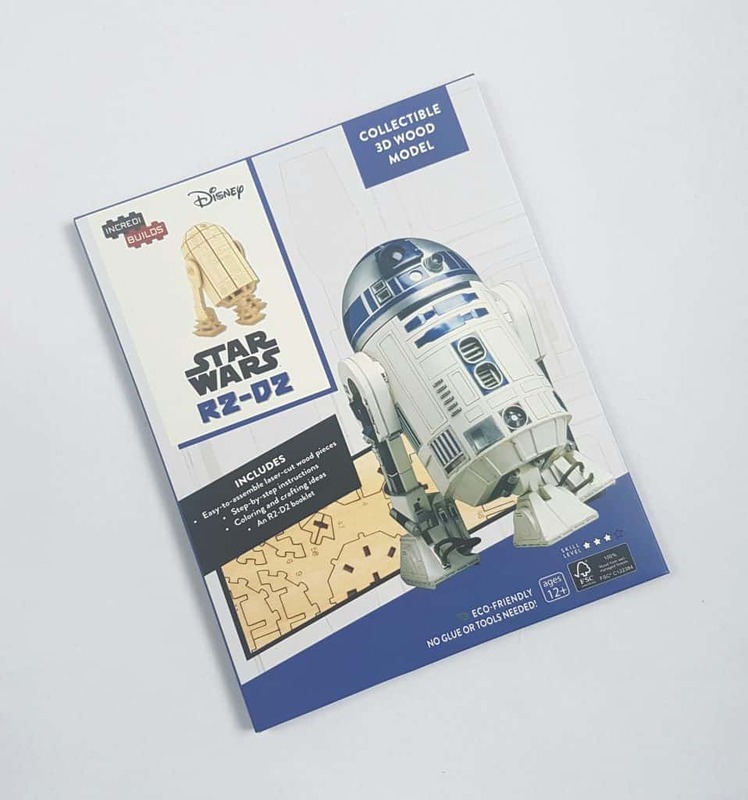 R2-D2 model: I can’t find this exact thing. You can find it easily on Amazon in a set with a book included, which costs £14.71. But as there is no book (shame) I’ll put this at £8. 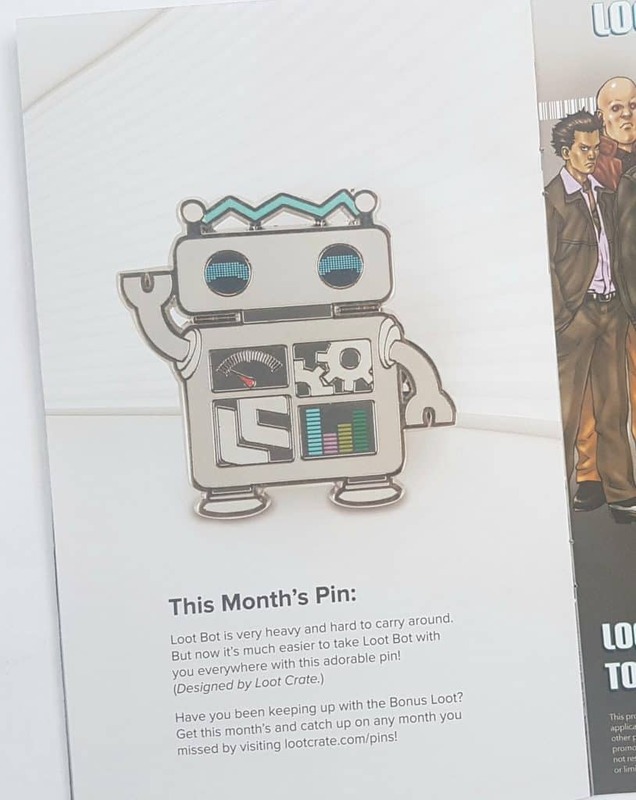 Pin – again, total exclusive, but comic pins are around £5. So even for your 1-month subscription price you’ve got plenty of bang for your buck. The t-shirt is awesome. Even though it’s too big for regular wear, I love my collection of LootCrate nightshirts! 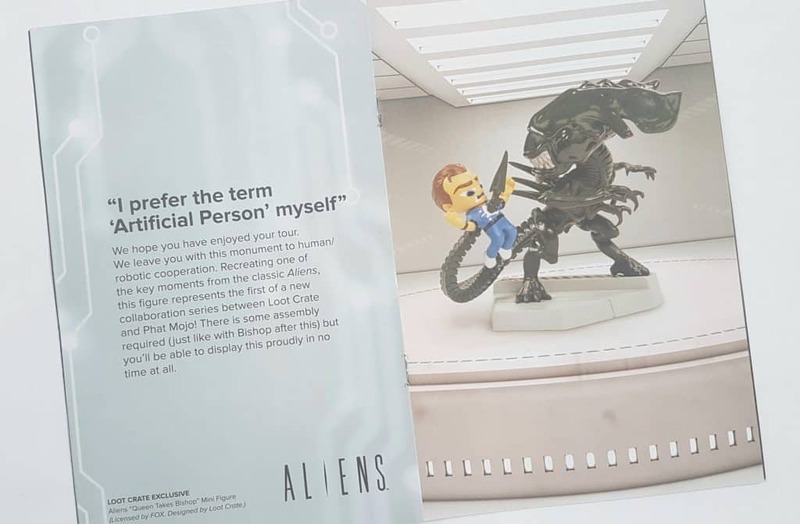 My husband and I both adore the Aliens figure. Even though it’s pretty small it’s got great details. Plus it shows an incredibly dramatic and sad moment from the movie. I’ll say now that I’m not a Star Trek fan, though I did enjoy recent movie reboots. So the comic feels a bit meh for me. However I’m sure Trekkies will love it. The R2-D2 model is quite nice. (Though apparently tiny. It seems to measure less than 3″ in height when completed). But having discovered it retails as a set with a book I can’t help but feel a bit bilked. It would be fantastic to have a book as well, as frankly, I think a book has a lot more long-term use. Oh well. I do like the pin. 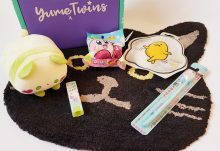 It’s really cute and fun, and a great addition to the collection. At the risk of sounding whingy, I don’t think they did well on the overall aesthetic. 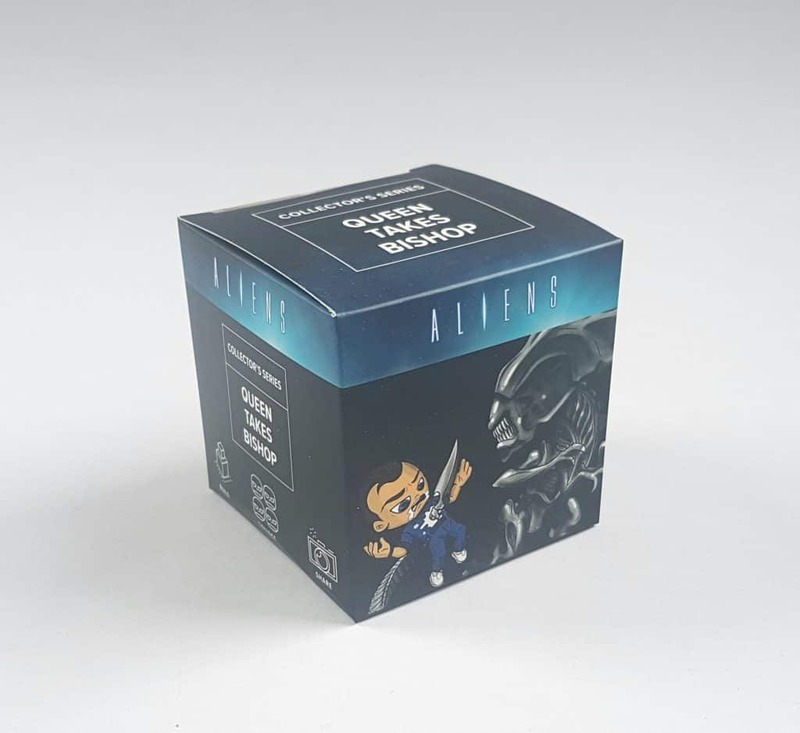 Two flat items make the box look really empty, so even though I was excited to see something from Aliens, my initial reaction was disappointment. Also, the menu booklet looks kind of dull. The basic layout is the same every month, but previous menus have been a lot more colourful. This one was not really a feast for the eyes. This is overall quite a nice box. The theme is well represented, and they’ve fit four franchises inside. The value is good, but as I said, two flat items (especially as I’m not so keen on them) made it feel a bit lacking. It just so happens that I’m not a fan of one of the franchises. 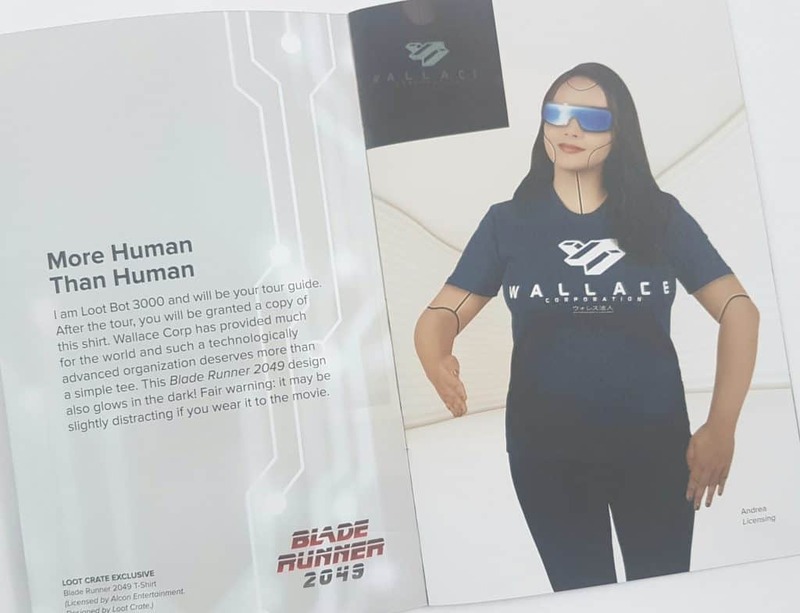 But fortunately the t-shirt and the figure are fantastic, and the pin is a lovely design, so they make up for the rest.